Today we are on our way out the door to do some more casting after missing last weekend. Next weekend we will be recruiting local friends and family to come out and have a big Cast-a-thon to finish up as many of the remaining pieces as we have molds for. Many of you have seen some of my new client work pop up here and there. Some of these pieces were commissioned before we launched the Bombshell Kickstarter and the clients have been patiently (and not so patiently) waiting to get them. Our current push to complete the project is dependent on many behind-the-scenes factors. The things I can share, I do. Most of the work I’m doing I cannot disclose until it is posted by my clients, so since it affects my production schedule it appears as if the Babes™ are the only thing in the works. However, there is currently a juggling act going on here at the studio to get a little bit done on everything. None of the work is being rushed. To be clear, I’ve been doing this for a few years now, and I know how long it takes me to sculpt a piece. Typically I can glance at a piece of art and breakdown the necessary steps of what it would take to make a model in a manner of seconds. Getting to these steps, when there are sixteen armatures in various stages of completion can be daunting. But, as many of you know who have done a bit of modeling or conversion work, there is a curing time to the sculpting putty that requires work to occur in cycles. That is why I have many many figures in progress at the same time. Even though I can cure the material faster by placing it under my heating lamp, it still all occurs at a constant pace. Also, we have to work with Reaper’s availability to help us with moldmaking. Their Bones project and the looming Reaper Con threat are all factors that compress our working time. All of this scheduling is due to coordinating the various aspects of our project with other folks who are helping to make the Babes™ possible. Our main production delay comes from the fact that we launched the project in the fall and lost lots of time due to holiday obligations and the unexpected emergency with Shas’tan’s surgery. But, everything seems to be back on track and we have a new strategy to complete the project over the next few weeks. 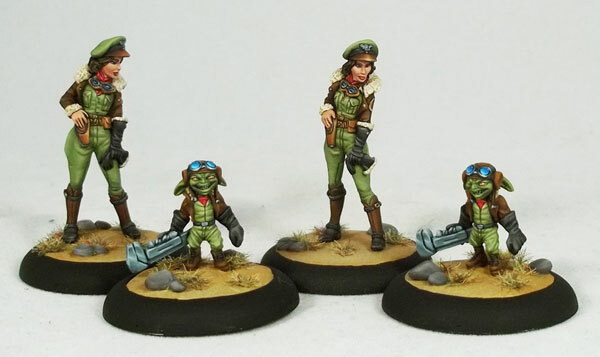 Now here is a cool shot of Betty and Shrapnel painted by the awesome brushmistress Jessica Rich. One set to keep and one set to share.